You know kaiju, right? Those Japanese-style monsters now have their own watering hole, which serves booze and eats. There's an important rule, though: No superheroes allowed. Don't you dare break it! This is "Kaiju Sakaba" (怪獣酒場). 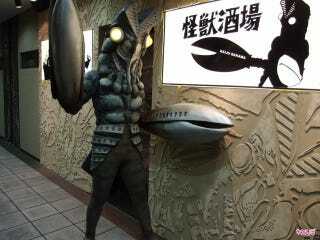 Located in Kawasaki, Japan, it's filled with kaiju from the popular Ultraman series, such as crab-looking monster Baltan Seijin. "Sakaba" (酒場) means "bar" in Japan, and inside, the establishment is filled with kaiju and Ultraman memorabilia. Websites Game Impress Watch, Net Lab, and Get News checked out the newly opened restaurant. This is Kaiju Sakaba's manager. He seems qualified. There are important rules: No superheroes and no members of the Science Patrol allowed. Get hammered at the bar with kaiju friends. There are over two hundred figures on display. Looks like someone forgot this! One part of the restaurant is a "research area," where the kaiju can study their human and superhero foes as well as their weapons and vehicles. This looks like a fun evening out. And here is the kaiju-themed food. Kaiju Sakaba is in front of JR Kawasaki Station. The limited time-only establishment will be officially opened starting tomorrow and will close next spring.